A further arrival to report at Rollesby based Jubilee Coaches is Van Hool bodied Scania K114 HY04HXK. It was new to Eirebus of Dublin as 04-D-325348 in April 2004. It has been acquired from Spratts of Wreningham and is now the fourth coach in the Jubilee fleet that has seen service with that operator. 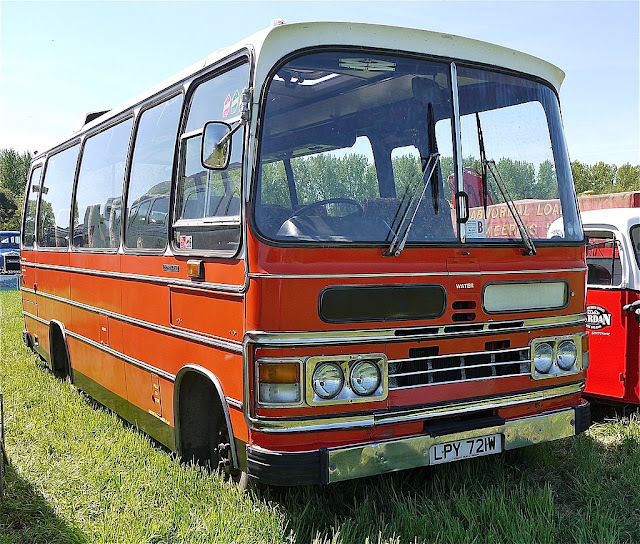 My thanks to Kevan Portas for the regular supply of news and photos from Jubilee Coaches. This morning's Notices and Proceedings Report contains a few entries concerning changes to local bus services and are repeated here for the sake of completeness. There are a couple of variations in existing First Eastern Counties routes to report. 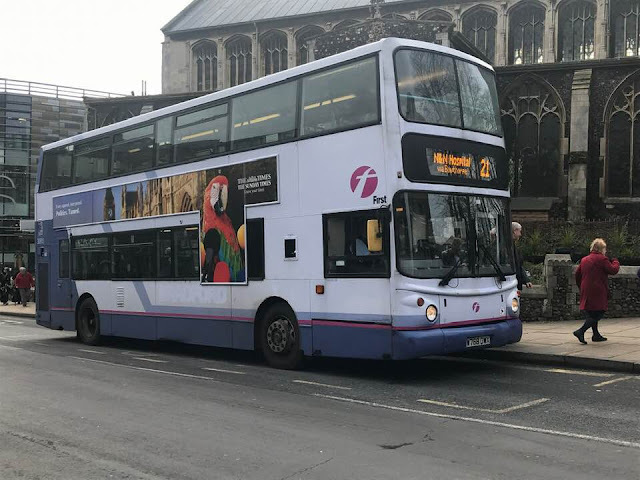 They include timetable amendments for the 40/40A/X41/41A/41 group of services between Hillside Road West in Bungay and St Stephens Street in Norwich. 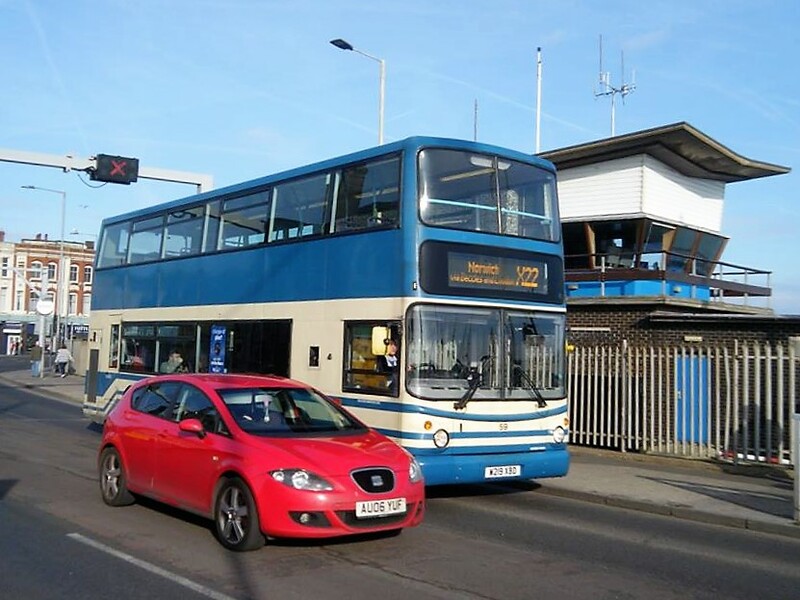 It is also changing the timetables of its 99/99B Lowestoft Bus Station to Southwold Pier Avenue service. First is also to amend the route, stopping places and timetable of 28/29/X29 between Norwich, St Stephens Street and Fakenham, Oak Street. All changes are to take effect from 31st March 2019. 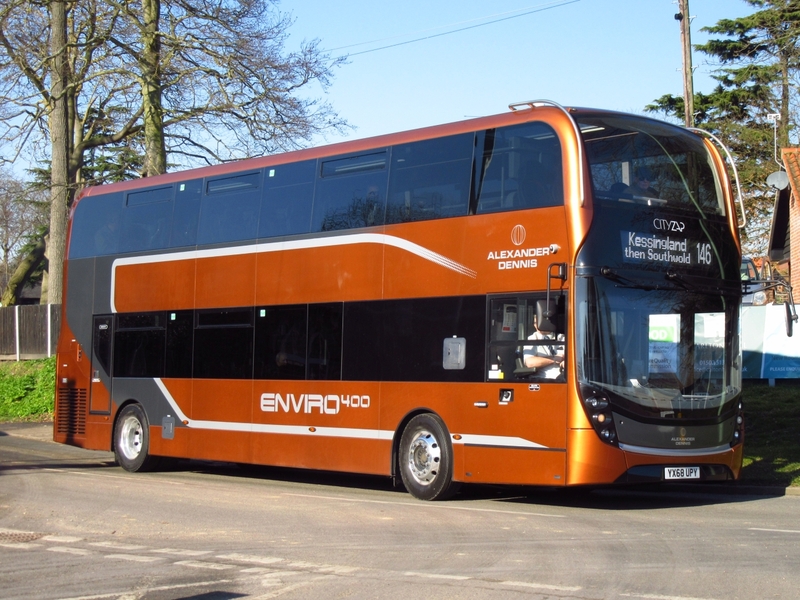 The operator is also to cancel its 925 Bramfield Road, Halesworth to Bungay High School service from 31st March 2019. Konectbus is to cancel its 87/88 Halesworth to Southwold service from 1st April 2019 with its 90 route between the two areas going from 21st April 2019. A third service cancelled by Konectbus is the BH272 between Wangford and Bungay High School from 1st April 2019. The full East of England Traffic Commissioner's Report will soon be available to view on the Gov.uk website. My thanks to First for the information and photo. After tripping over SteveW near Morrison's in Lowestoft, and following our photo of the BorderBus demonstrator, we both headed over to their Beccles depot at Ellough. Whilst there I noted that a couple of Plaxton President bodied Volvo B7TLs were out of use and were being robbed for spares - namely X647LLX and LK51XGH. My thanks to the staff at BorderBus for their time and help. 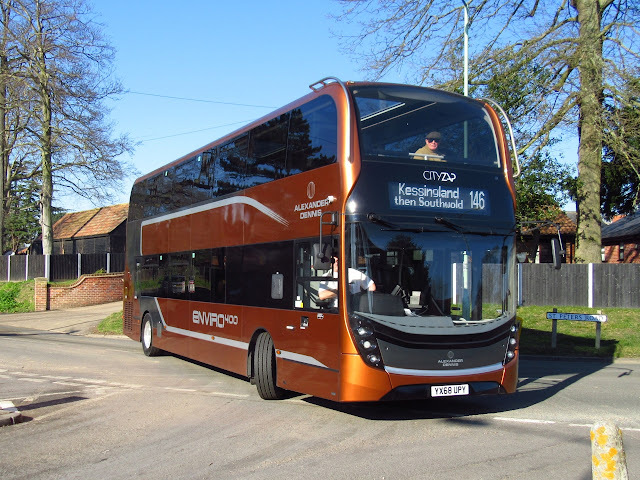 Borderbus of Beccles have taken delivery of Alexander Dennis Enviro 400 MMC Demonstrator YX68UPY for use on their 146 service between Southwold and Norwich. It entered service this morning after arriving at Ellough on Monday morning, It is being evaluated for Fuel Economy purposes during its time in Suffolk. I managed to get some sunny shots of it this morning in Carlton Colville as it headed to Southwold. 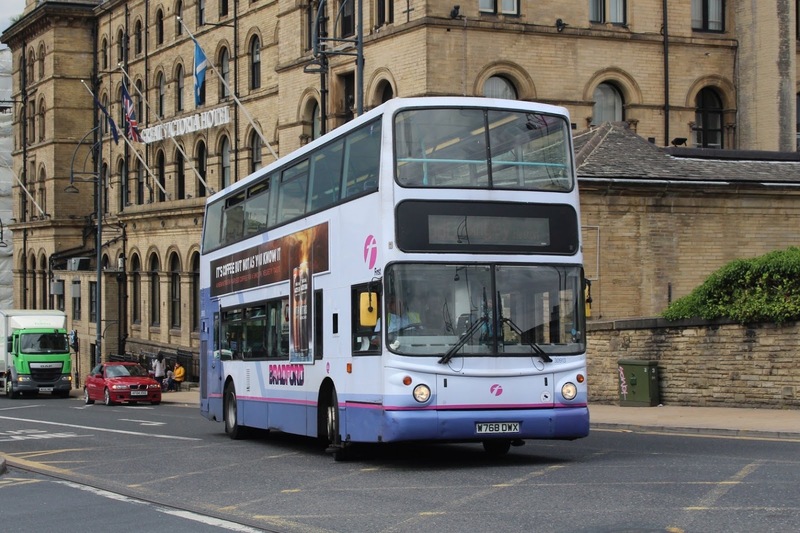 It has also recently seen use with Go Ahead North East and latterly with Transdev Yorkshire operations before heading to the East Coast. Thanks to Borderbus for the info on timings. The latest news from First is that Lowestoft's Alexander ALX400 bodied Volvo B7TL 30886 W741DWX has been withdrawn with engine failure. Its replacement from Norwich is none other than similar 30913 W768DWX. It looks as though the search for another training vehicle is on the cards!! 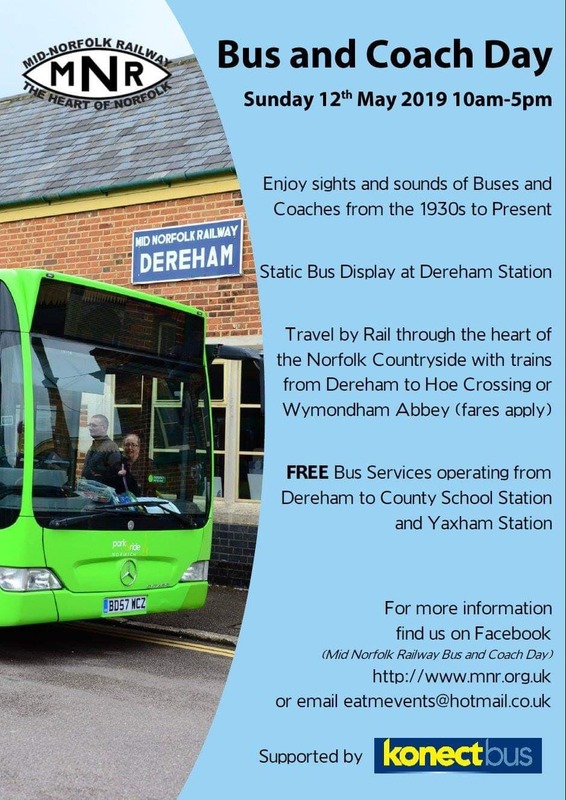 Operationally, some of you will probably be aware that First is to provide a new 99A service connecting Southwold, Halesworth and Bungay. 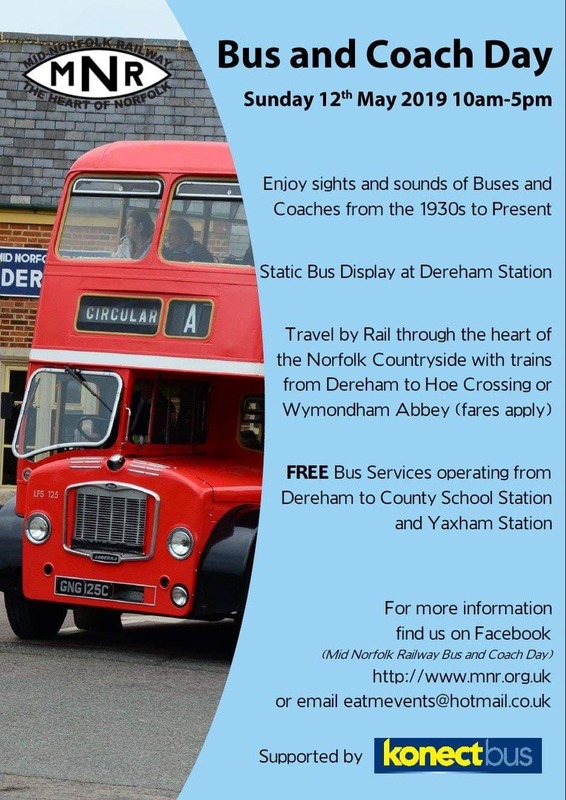 This is mainly a commercial service although some funding is being contributed towards the former BH272 school run from Blythburgh to Bungay which will be numbered 99H. This is to make the general public aware that they could also use the service! On arrival in Southwold the 99A buses will become the 99 to Lowestoft and, therefore, in most cases offer guaranteed connections to Lowestoft. Coastal day tickets are valid on all 99A journeys extending all the way to Lowestoft and Great Yarmouth. Additionally Halesworth to Norwich passengers can change at Bungay using the new Explorer tickets which are still cheaper than current Konect tickets! First has tried to provide as good connections as possible at Bungay for Norwich, but recognise it is not perfect. The operator says facts prove that an hourly service is not viable or sustainable. A BorderBus driver has posted on the Norwich Bus Enthusiasts Facebook Group that the Suffolk operator has taken delivery of Scania OmniCity YR61RUY. Delivered new to Centrewest in October 2011, it recently saw service with Metroline. BorderBus are also expecting to have a demonstrator on the road from early next week. My thanks to Sam Larke and BorderBus for the information. Great Yarmouth heritage liveried Alexander ALX400 bodied Volvo B7TL W219XBD found itself working Lowestoft based services yesterday. Our Lowestoft correspondent Simon Bartram observed it on a 99 service to Kessingland during lunchtime. He later photographed it on Waveney Road in Lowestoft about to leave on the 14:40 X22 service to Norwich. 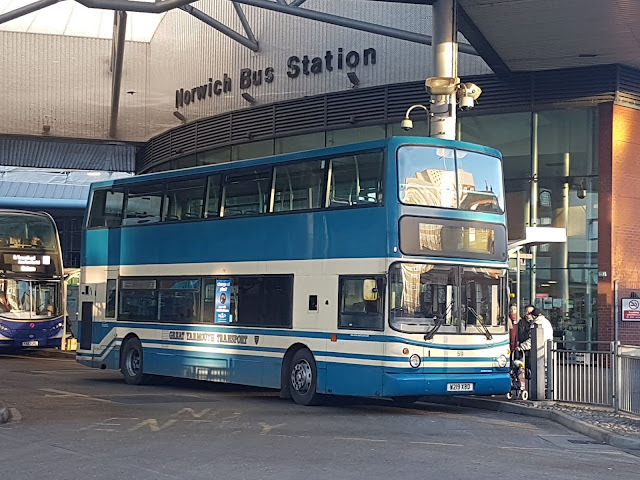 At Norwich Bus Station Omar Atiallah recorded its arrival prior to it returning to Lowestoft on the 16:20 X2 service. My thanks to Simon and Omar for the information and photos. A few errands to deal with in Gorleston High Street during yesterday afternoon in between which I managed to grab a couple of photos. The first photo shows former First Manchester Alexander ALX400 bodied Volvo B7TL 30948 YJ51RRV on the 8 to the James Paget Hospital. It was recently transferred from First Norwich. The second is of BorderBus ADL Enviro200 104 BB62BUS on the 580 Waveney Line to Bungay service. It looks to have recently been cleaned and has branding for the Southwold - Beccles - Norwich route. There is nothing of relevance to our local area in this morning's Notices and Proceedings Report. However, of interest is the timetable amendment by David McMaster, trading as Awaydays, to the Norwich city centre route 1 from 1st April 2019. The complete East of England Traffic Commissioner's Report will soon be available to view on the Gov.uk website. 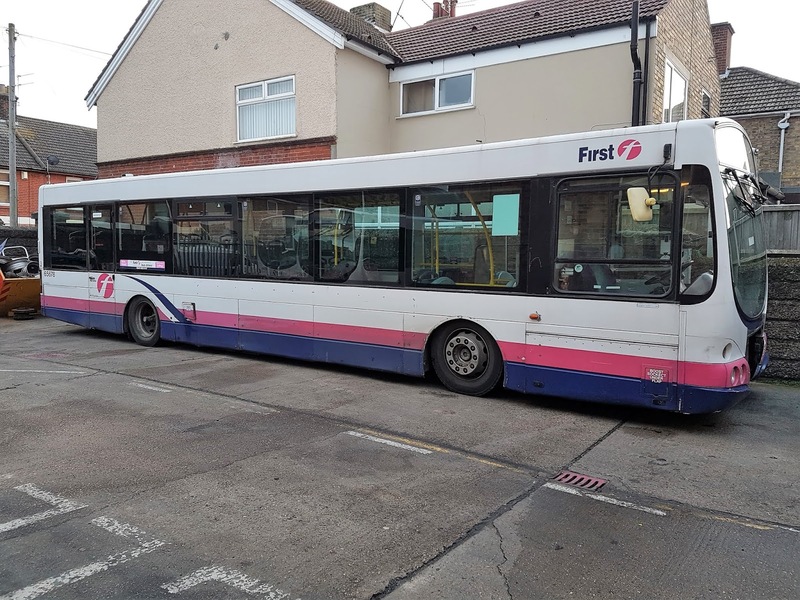 Former First Bradford Volvo B7TL 30913 is the latest arrival for First Norwich which we reported a few days ago, initial reports had it as a Driver Trainer replacement for the withdrawn 32809 which sadly suffered engine failure. However due to vehicle requirement in the city 30913 was quickly pressed into public service and was noted in use on service 21. 30913 seen in Theatre Street heading for the N+N Hospital. Many Thanks to Chris Dugdell for use of his Photo. The new arrival brings the fleet total up to eight coaches and minibuses. 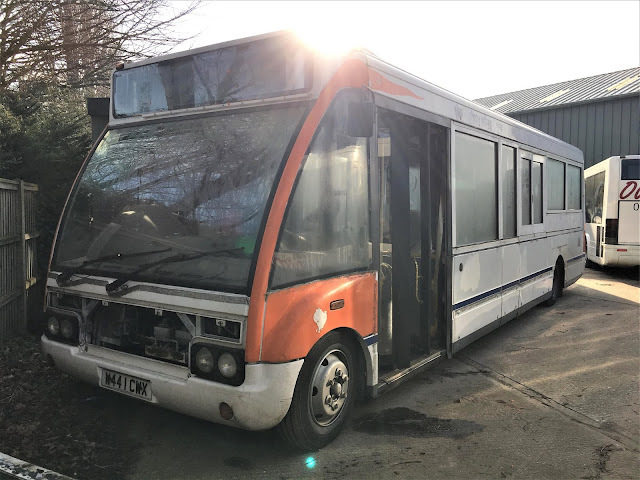 Following the post of 27th January (Our Bus News) regarding the impending arrival of Optare Solo W441CWX, Sam Larke has supplied a photo of it in the Our Bus yard. 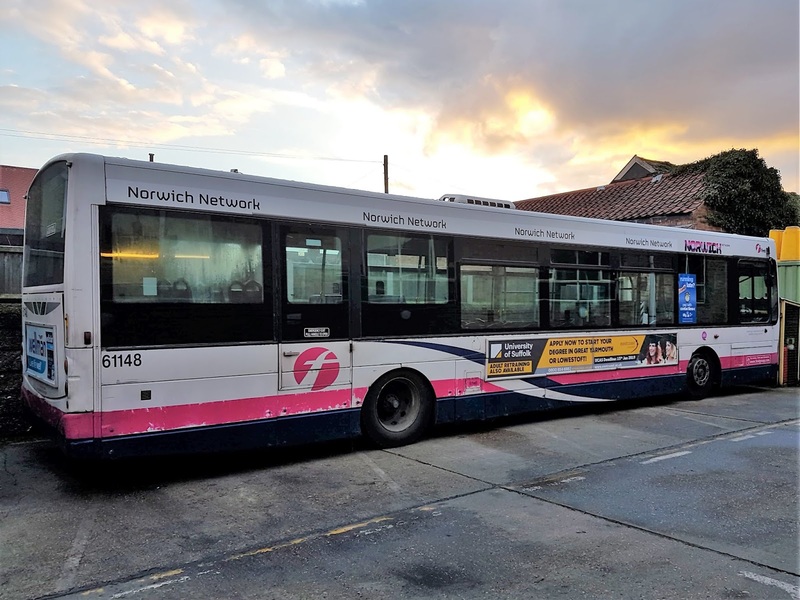 With engineering work being carried out on the local rail network, replacement buses were in use at both Great Yarmouth and Lowestoft stations during the weekend. Earlier this afternoon Smiths Coaches' Volvo B12M FP51EUN was ready to receive its passengers at Great Yarmouth Station whilst Wright Coaches' Scania K114 R25PTS was on standby. It appears the oldest member of the current FEC fleet has finally expired, Trident 32809 T809LLC has given up after engine failure at Norwich. It was latterly being used as a Driver Trainer. 32809 pictured at Caister Road last year. A Replacement for the driving school has been sourced from First Bradford in the shape of Volvo B7TL/ALX400 30913 W768CWX. 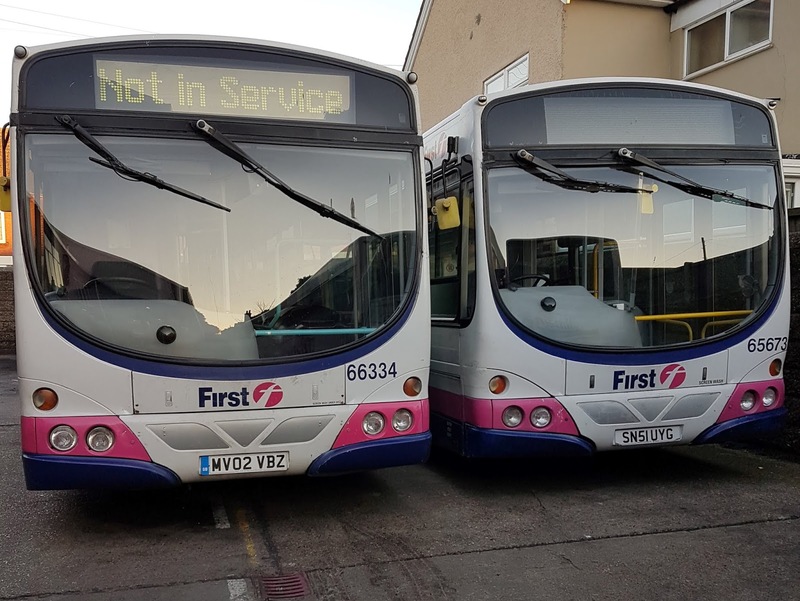 Thanks to First for the info and to Mark Doggett for use of his photo. A total of seven coaches were observed on the trip around Great Yarmouth earlier this morning. Outside the Hotel Victoria on Kings Road was Majestic Travel's Mercedes Benz Tourismo BN17JMX whilst on the hotel car park was Skills of Nottingham's VDL Futura YJ13HVB (pictured). One of those rare mid week days when I was determined to get to Norwich to photograph activity in the Fine City. It initially meant a stroll to the city centre via Bishopgate and I was hopeful that I may see a Norwich School Olympian in the lay by. There wasn't, but there was a Dolphin Travel Bova in the form of FRZ2054. On arrival in the city centre, it was noticeable that Konectbus were using vehicles of many colours as the attached photo shows. Here former Go Ahead London red Wight Eclipse Gemini LX05EAJ is passed by ex Thames Travel ADL Enviro200 SN10CCZ. Lurking behind the twosome in the photo is Bluestar liveried Mercedes Benz Citaro 426 HF55JZD on 'the shining bus service for Southampton' - a little off route perhaps! At the Castle Mall entrance, on Castle Meadow, were two Sanders Coaches on a school trip. Former Lochs & Glens Volvo B13 920 BT14DLZ was parked in front of ex Parks of Hamilton Volvo B9R 918 SD60DGO. 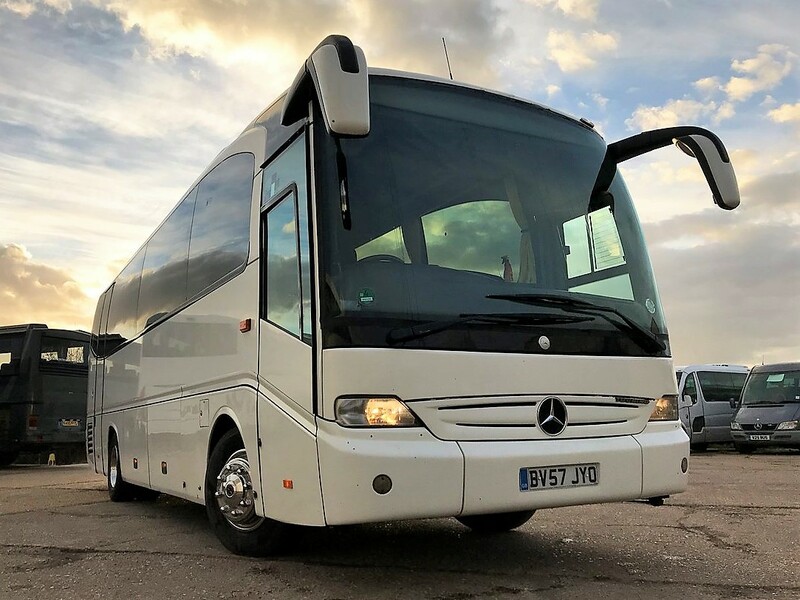 A former Sanders vehicle seen in its new guise was VDL/ Berkhof YJ12CHK now re-registered by its new owner Felixstowe Travel as M30FXO. It was one of two of the fleet seen on Theatre Street - the other was Volvo B9R M50FXO. Of the National Express services I saw, all three were in the hands of Whippet's Caetano Levantes including the 490 London service. Yes, I know I haven't posted a First photo, but I didn't notice anything that unusual to report! Last Thursday I reported on the abandonment of a long term plan to preserve ex OK Motor Services Bedford VAS5 LPY721W. (see Jubilee Coaches Update) Subsequent developments have now taken place. Late yesterday afternoon the Bedford was being prepared for its long journey to Liddells of east Ayrshire. Apparently it will be joining three others there, hopefully for preservation and not as a source of spares. My thanks to Kevan Portas for the information and photo. There are a couple of entries of interest in this morning's Notices and Proceedings Report concerning our local area. BorderBus is to vary the timetable of both parts of its 146 route from the 25th February 2019. They operate separately as Southwold to Kessingland and Kessingland to Norwich services. Wright Eclipse Gemini bodied Volvo B7TL 32348 LK53LZL has returned to service at First's Caister Road depot. 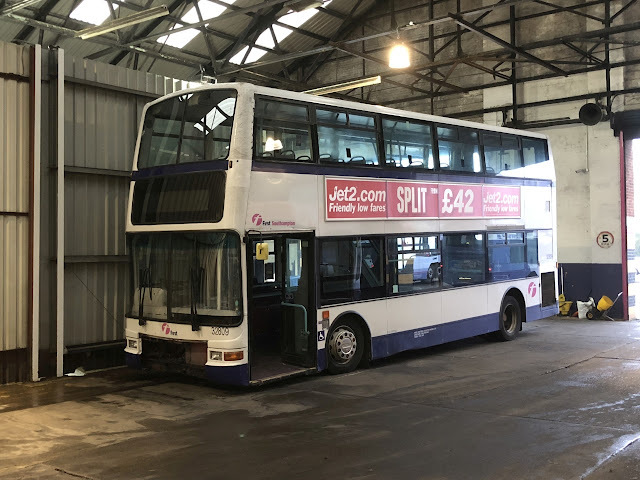 Meanwhile, Volvo B7 saloon 66344 MV02VCX has moved to Roundtree Way in Norwich and is expected to be converted for driver training purposes. Six coaches were observed on my trawl around the usual haunts in Great Yarmouth early yesterday morning. Three of them belonged to the Shearings' fleet and were parked in close proximity to their Carlton Hotel on Marine Parade. Two 18 registered Mercedes Tourismos were seen in the form of 149 BU18YTD and 133 BU18YSK (pictured). Also present in front of the SeaLife Centre was aROSA River Cruising liveried Kassbohrer Setra 637 BT63GCX. Noted close to the Britannia Pier was Gee-Vee Travel's VDL GT16GVT with National Holidays' Kassbohrer Setra NH14EBH immediately behind.